Unicorns are some of the most exotic animals of them all. They’re so exotic, some people say they don’t even exist. But we believe in unicorns, and we especially believe in awesome, magical unicorn gifts. If you have a friend or family member who loves unicorns or just needs a little bit of glitter, rainbow, and magic in their lives, then we have just the gift for them. We’ve rounded up 10 unicorn gift ideas that will surprise and delight your loved one and add an extra dash of magic to their day. Slippers are a must have item for anyone that lives in a climate with cold seasons. 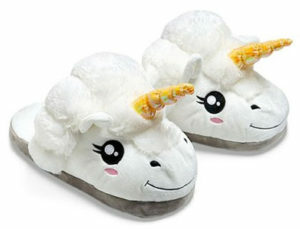 Unicorn slippers–that’s a no brainer. Easy to slip on and super comfy, these plush slippers feature two unicorns with magical horns. Add some sparkle to your loved one’s routine with these slippers. This is a cute gift that’s perfect to buy for a co-worker or as a stocking stuffer for a family member. 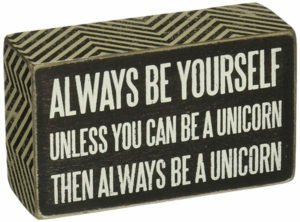 This box sign says “Always be yourself, unless you can be a unicorn, then always be a unicorn.” This wood box sign can be displayed on a desk or shelf or easily hung on the wall. 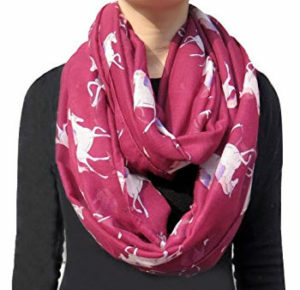 This unique design by Lina & Lily features a whimsical print of realistically illustrated unicorns. Made from lightweight fabric it’s the perfect fashion accessory for any season. With four different color options you’re sure to find the perfect one for your loved one. 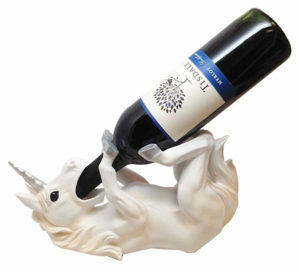 This is a unique and fun gift for any unicorn lover who also enjoys a good glass of wine. This polyresin statues is handpainted and holds a bottle of wine so it looks like the unicorn is enthusiastically drinking it. This makes a great gift to pair with a bottle of their favorite wine. If you want to give your loved one the experience of feeling like a unicorn, this is the perfect gift. These cozy and warm onesies are great as winter pajamas or to wear as a super easy Unicorn Halloween costumes. It’s also available as a hoodie if you’re not ready to go full onesie. If your loved one is into the adult coloring book craze, they will LOVE this gift. 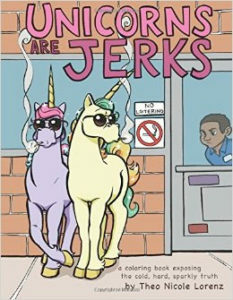 This humorous coloring book looks at the dark side of unicorns and highlights some of their rude behavior that may often be overlooked by unicorn fans. Include some colored pencils or markers to make the ultimate birthday present or Christmas gift. Want to add some extra magic to your lazy river or backyard pool? 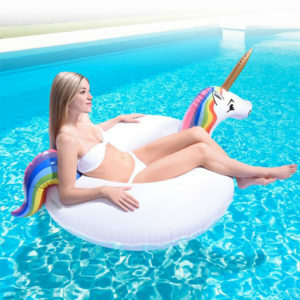 This inflatable unicorn raft is perfect to make you feel like you’re riding your own magic steed. Don’t forget the sunscreen! 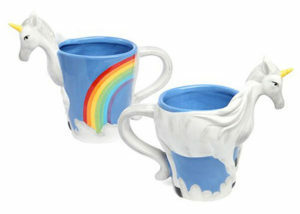 This is the ultimate unicorn mug, all other mugs are missing the magic and beauty of this mug. Featuring a full, three dimensional unicorn and a beautiful rainbow, this will definitely add some glitter and joy to your loved one’s mornings. Add some of their favorite coffee, tea, or hot chocolate to make an unforgettable gift. This is a fantastic stocking stuffer or office Secret Santa gift idea. 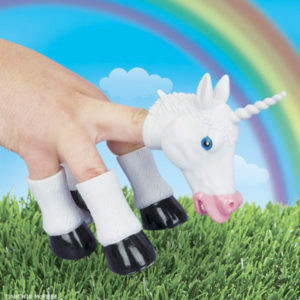 Turn your hand into a majestic unicorn with the Handicorn. It comes with a unicorn head and four hooves made from soft vinyl. This is fun for kids or adults. If you’re looking for unique unicorn gift ideas that you can’t find in stores, this is a great option. 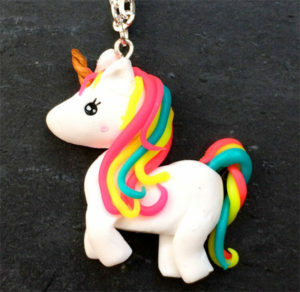 These handmade unicorn necklaces are one of a kind pieces of art made by an artisan called Akiko. They are handmade from polymer clay and completely unique. Looking for more funny and wacky animal gifts?. Check out mermaid gifts, gifts for hippo lovers, and cute panda gifts.